One of the things that I enjoy most about my family’s Disney vacations is the anticipation, the planning, and the countdown – how many days until we check in? Now Disney has released a great tool leading up to your vacation – the Disney Vacation Connection desktop widget for your PC or Mac. Pluto and his Mickey ears suitcase welcome you to the Vacation Connection widget. It first asks you if you are 1) wanting to see what Disney destinations has to offer, 2) planning a trip but haven’t booked or 3) already booked and can’t wait to go. You choose your option, and in the case of already having booked a vacation, you’re asked to plug in your dates, your resort, your home zip code and more to customize your experience. If you haven’t booked yet, it showcases all the Disney destinations and has you choose what’s best for you. My favorite part of the widget is the countdown clock – now I know exactly how many days I have to wait until I pass under the big Walt Disney World sign and start to feel the magic of my vacation. The widget also displays the weather at Walt Disney World and the weather in your home zip code – so it would be something useful on the day before or day of your journey to the World. There are even more features on the widgets. Under “My Destination,” you’re given a checklist of things to do before your trip, such “Check in online up to 10 days in advance” and ‘Make your dining reservations up to 180 days in advance.” This is a great checklist for a Disney newbie. There’s also a helpful event calendar tab listing all the major events at the Walt Disney World theme parks. A “Trip tools” tab shares video overviews of all the theme parks, as well as a video on “Enhancing your Celebration,” which gives tips on celebrating your anniversary, birthday or other special occasion. Click here to download the Disney Vacation Connection desktop widget. I hope it aids you and entertains you as you count down the days until your Disney World vacation! UPDATE: The Disney Vacation Connection widget program was sadly discontinued at the end of 2011. This entry was posted on Sunday, August 15th, 2010 at 9:41 pm	and is filed under Planning. You can follow any responses to this entry through the RSS 2.0 feed. You can leave a response, or trackback from your own site. How am I just finding out about this widget now? I must download! I was supposed to sign up for vacation connections and can not find where to do that. Could you help with that please? 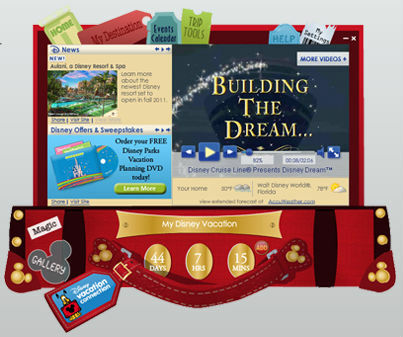 Sadly, Disney World announced that this fun little piece of software ended at the end of 2011.